Those of you familiar with the food recipe I’m sharing today are probably having a good laugh at the translation of the name. And you should! I’ve been chuckling since I translated ‘Doi Boonde’ or ‘Dahi Boondi’ into ‘Golden Sweet Balls with Yoghurt’. I’m honestly at a loss for words here. The emotional connect with the delicious, crispy and sweet boonde are lost when I call them ‘golden sweet balls’ but what is the option? Where are the words that describe the rush of memories at the mention of making boonde at home? How does one translate the delight that used to fill this little girl’s eyes when they spotted the heap of boonde at the neighbourhood sweet store? Or the delight of being seated on the kitchen platform, watching Maa pour batter into a kadhai only to scoop out golden balls! It was magic! And magic is what I wanted to begin the Bengali New Year with. Sending love and good wishes to all of you celebrating a New Year today. Good fortune, love, happiness and success are what I wish for all of you in this new year. A departure from the traditional sweets served at the Bengali household on Poila Boishakh, the boonde is more prominent as a snack or a sweet breakfast. But there is something so beautifully simple and fun about having these crispy sweet balls with thick, homemade yogurt! Trust me when I say there is nothing as refreshing as this version of the boonde. And that is what makes this the perfect dish to end our Poila Boishakh meal series on AND give you greetings for a beautiful new year with. * The batter should be smooth. * The lesser the amount of oil, the more time it takes to fry the boonde. * The bigger the holes in the ladle, the bigger the size of boonde. * Hold the ladle 5-6 inches above the oil to avoid being splattered. * The sugar syrup needs to be thin so that the balls can absorb the liquid. * Coloured boonde are just a fun option. Hope you enjoy making boonde as much as I enjoyed making them! For those of you who want to try some other Bengali sweet dishes, I’ve previously shared recipes for the Mishti Doi (Sweet Yoghurt), Labanga Latika (Clove Parcels) , Chhana Payesh and Khejur Gud Payesh (Rice puddings) on the blog. Do let me know if you make this sweet dish and tag From The Corner Table on social media. You can follow the blog on its Facebook page, Instagram and Pinterest for regular updates. 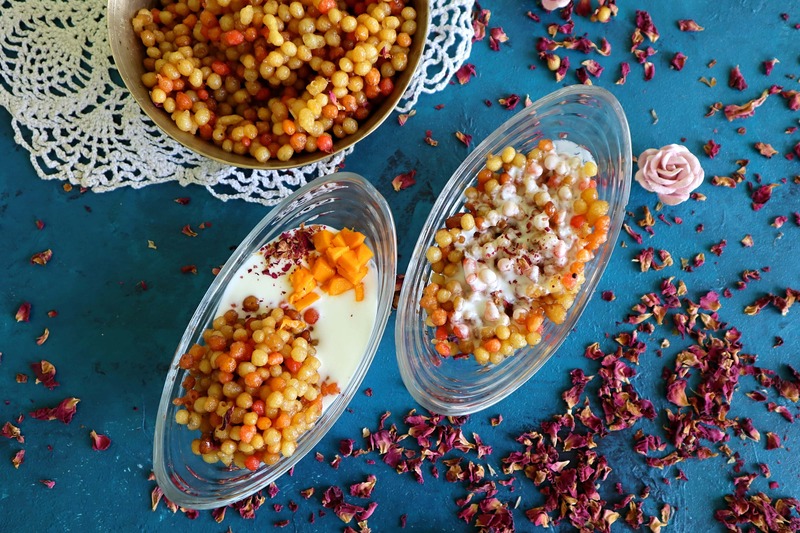 Boonde, tiny crispy balls of gram flour dunked in sugar syrup, served with yogurt. In a large pan, heat 2 cups water and sugar. Add Lightly crushed cardamom pods. Allow the mixture to simmer till the sugar has dissolved; you need sugar syrup of medium consistency. Remove from flame and set aside to cool. In a separate bowl, mix the chickpea flour with rice flour and soda bicarbonate. Make a batter by gradually adding water; you need a batter of medium consistency. Remove 1/4 cup of batter in a separate bowl. Add a few drops of red colour, mix well. Repeat with orange colour. Heat oil in a kadhai or wok; check if the oil is hot enough to use by adding a drop of the flour batter. If the batter sizzles and floats up, you know the oil is ready for use. Hold a perforated ladle above the hot oil and through it, pour ¼ cup of batter into the hot oil. Pour batter only until the surface of the hot oil is covered with small balls. Fry till the balls are golden brown; strain and set aside on a kitchen towel. Let the boonde rest for a minute before dropping them into the warm sugar syrup. Repeat the process to use the entire batter. Don’t forget your coloured batter! Let the boonde rest in sugar syrup for at least an hour. Whisk the yoghurt until smooth. Pour ½ cup of yogurt in a serving bowl. Add half a cup of boonde to the yogurt. Garnish with some chopped mangoes. Serve cool. Pour ¾ cup boonde in a serving bowl. Drizzle 2-3 tablespoons of yogurt over the boonde. Serve.